It's no secret that The San Jose Blog is fond of food; from restaurant openings, a full downtown restaurant spreadsheet, to the many Dishcrawls and Moveable Feast adventures -- we're simply addicted to eating! So, when along comes another food truck adventure - we're happy to share it with others! You may have already heard about it, but this Thursday is Beta Tasting! There will be 10+ food trucks with varying cuisines, coming together to share over 20 experimental dishes. Tickets for the event are $2 each; all the dishes are priced $3-$5 each. So it's up to you what you'd like to try. After trying the dishes, you can vote for your favorites as well. But this is more than just a food truck gathering. Proceeds from Beta Tasting benefit the livelihood and union of food trucks in the Bay Area through the Bay Area Mobile Food Vendors Association (BAMFVA). 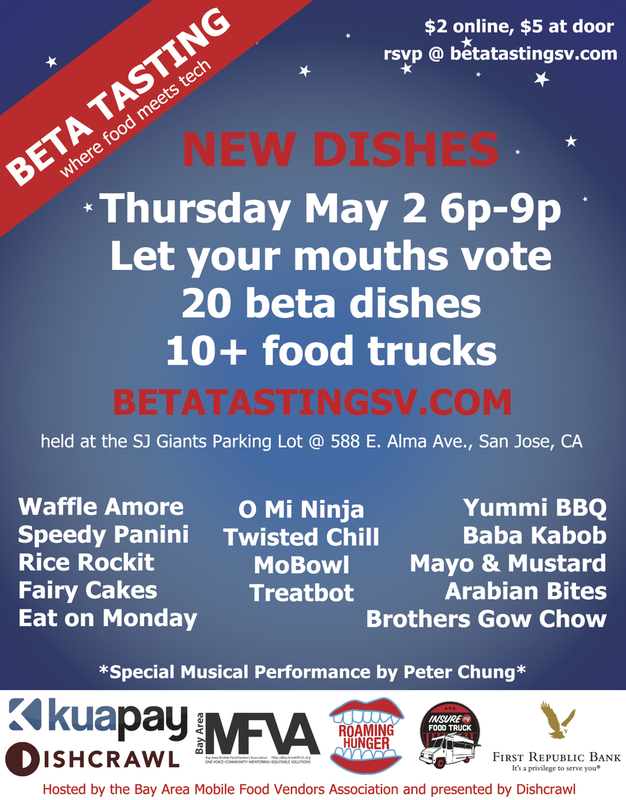 I got in touch with a couple of the participating food trucks and asked the owners why they decided to participate in Beta Tasting and what they felt they'd gain in return by being part of this event? As food truck owners, we are excited to have an association that represents us and our businesses. We are a group that has no representation when it comes to regulations, events, and legal representation. Most food trucks are independent, and small businesses that need to have resources available to them to sustain their own business. When it comes to the food, we are a group of people that loves to cook, and want to be involved with presenting great food from truck. I am a one of the members of the Board of Directors for the very new BAMFVA (Bay Area Mobile Food Vendors Association). The association is hosting this event in conjunction with Dishcrawl. It is our first fundraising effort to raise some money as we are still in the process of establishing the association. It will be the first event of its kind where each truck will be offering a brand new dish that no one else will have had the chance to try before! An opportunity to experiment with new recipes and for food truck fans to tell us what they think! So what kind of dishes can you expect to see? Eat on Monday will be featuring a Dungeness Crab Rangoon which is crispy fried wonton skin wrapped Dungeness crab, cream cheese, with a spicy and sweet Thai style dipping sauce. Along with that, they'll have an Egg in the Hole Burger and Fried Milk. 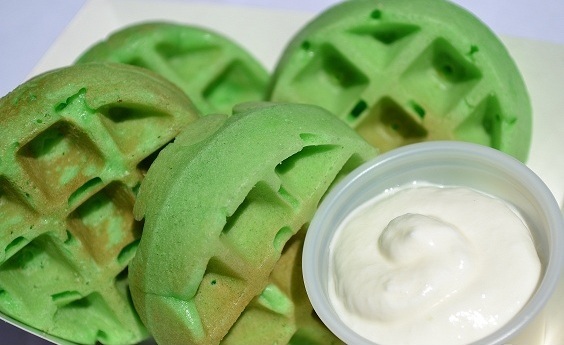 O Mi Ninja will be featuring Gluten-Free Vietnamese Carmelized Shrimp over Vermicelli Noodles, Honey Ginger Lemonade, Mini Pandan waffles with coconut whipped cream (see photo), Kumquat Limeade, Mini Ninja Banh Mi sandwich (A smaller version of their most popular banh mi combining all of their meats plus bacon and egg) among other items. There are many more trucks that will be there. Be sure to check out Dishcrawl's event page for a full list. Maybe you'll find your favorite truck there and something new to taste! This event is hosted by the Bay Area Mobile Food Vendors Association, the first owner operated organization benefitting the livelihood of food trucks and presented by Dishcrawl.